Back to School Traffic Safety! We have had a busy summer in Rocky River and with school resuming this week it will only get busier! Please take a few minutes to remember some basic traffic safety rules, no matter how you plan to get around this fall. If you drive, please be aware that there will be more pedestrians during school commute times. Take the extra time to look for them, especially before turning right and driving through crosswalks. Watch for pedestrians when pulling onto a roadway from driveways, shopping centers, or other private property. Drivers have a duty to stop prior to crossing sidewalks and to yield to pedestrians. Remember to stop for school buses when they are loading or unloading children. If a school bus has activated red flashing lights or deployed a stop sign, it unsafe and a traffic violation to overtake the school bus going the same direction on any street. 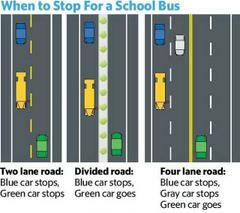 If a street has four or more lanes or is divided by a median, drivers may pass a school bus going the opposite direction. Watch our for bicycle riders, too! Bikes can operate on roadways or sidewalks in Rocky River. If a bicycle operator chooses to ride in the street, he or she must comply with all traffic laws, including riding with the flow of traffic, obeying traffic control devices and traffic lights, signaling intentions, and having proper lighting during restricted hours. If a bicycle rider chooses to ride on the sidewalk, he or she must comply with pedestrian traffic laws, like crossing at crosswalks and with traffic signals. Drivers of motor vehicles must stay at least three feet from bicycles when passing in the roadway. It is recommended that bicyclists always wear a helmet when riding. Rocky River law requires pedestrians to walk on sidewalks when they are available. If there are no sidewalks available, pedestrians may walk in the roadway, against traffic, staying as close to the curb as practical. Road construction and improvements continue throughout Rocky River, including water and sewer work on Lakeview and Hampton Roads, and repaving throughout the City. The City will continue to update residents as the roadwork progresses. As always, please report any traffic hazards to the Rocky River Police Department at 440-331-1234.